As protests continue to mount in Australia over government programs designed to kill sharks that arrive too close to shore, the targeted animals are being saved by an unlikely ally -- pods of hungry dolphins. Offshore from a number of popular beaches, baited drum lines have been installed to indiscriminately hook passing predators as part of an indelicate effort to keep swimmers safe from attack. 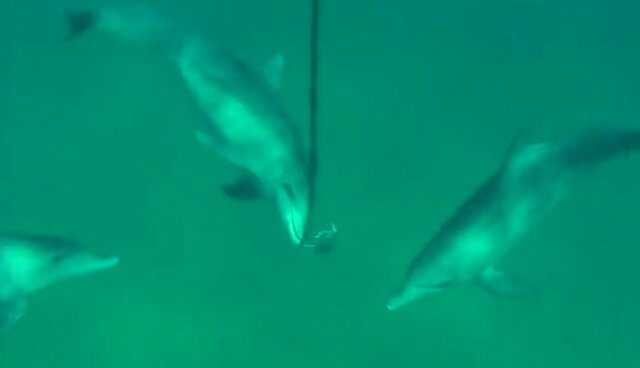 But this method of snaring sharks is being thwarted by clever dolphins, who have evidently figured out how to strip the hooks clean without getting caught by them. This scene was filmed off the coast of Queensland, where 386 drum lines are used as part of a hotly debated shark-mitigation strategy. While officials deny that the action is a cull, more than 600 sharks were randomly killed as a result of this program last year alone -- though that number would likely be much higher if it weren't for the work of dolphins in making a meal of the bait which is checked on every 21 days. "We decided to release the vision to the public just to show another angle to the story," says marine expert Richard Fitzpatrick. "On the drum lines, a lot of them are rendered useless within a few moments by dolphins."